But a new study suggests that the effects extend to those who learn a language from the age of 10 onwards. The research found that people who began learning English in middle childhood showed improvements in the structure of the brain's white matter. These 'higher levels of structural integrity' were in areas responsible for language learning and semantic processing. The findings mirror observations from previous studies that found these improvements in people who learned a second language at a much earlier age. Researchers studied brain scans from 20 people, all around the age of 30, who had lived in Britain for at least 13 months. They had all started learning English as a second language around age 10. 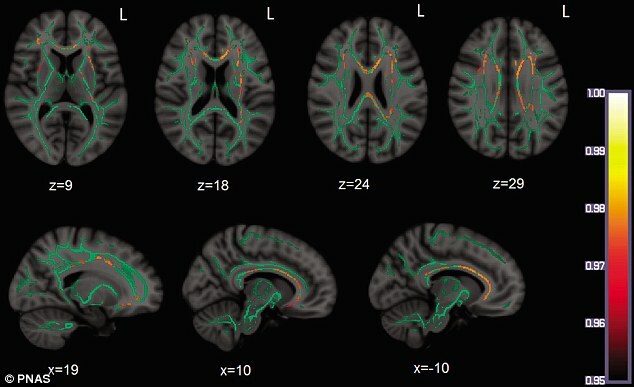 Their imaging analyses were compared to 25 people of similar age who spoke only English. 'Everyday handling of more than one language functions as an intensive cognitive stimulation that benefits specific language-related brain structures by preserving their integrity, and therefore it protects them against deterioration in older age,' said the study led by Christos Pliatsikas of the University of Kent School of Psychology. Since previous studies had mostly relied on people who learned two or more languages beginning in infancy, scientists say more research is needed to close in on exactly when these positive brain changes begin to take root. The research follows a similar study in June which found that Learning to speak a second language at any point in your life could help keep your brain sharp as you age, a study suggests. Academics at the University of Edinburgh detected a pattern of slower mental decline among the bilingual in a group of 835 born in 1936. They were given an intelligence test in 1947 at the age of 11, then retested in their early 70s between 2008 and 2010. A total of 262 participants could communicate in at least one language other than English. Of those, 195 learnt the second language before the age of 18. Those who spoke two or more languages had significantly better cognitive abilities in their 70s than their peers. The strongest effect of bilingualism was seen in general intelligence and reading tests. Previous research had suggested that bilingualism might improve cognition and delay dementia. But until now scientists were unsure whether learning a second language improved mental stamina, or whether those with better cognitive functions were more likely to become bilingual.